This lesson will introduce you to how to use color to enhance your living environment on the inside and the outside. My children’s former kindergarten teacher was amazed by the way her students responded to colors. Early in the school year, when the walls were mostly bare and white, the children were subdued. As they got further into the semester and the children’s colorful artwork was hung up covering more and more wall space, they got more and more active. When she took down the artwork and the walls were mostly white again, the children once again became more manageable and subdued. One of my favorite anecdotes about the Chinese theory on how we are affected by color actually made it into a Bay Area newspaper. The ochre paint of a house in Berkeley was damaged by the heat of a nearby fire and began to peel off, making the house look shabby. The owner began to suffer from constant illness and even developed an abdominal tumor. “The color affected my health, career, and wealth,” she said. After — at Master Lin Yun’s suggestion — she had the house painted purple with white trim and pink stairs, her tumor was successfully removed. While some neighbors protested the colorful house as an eyesore, even they softened their stance once the house became a landmark and a useful guide to friends trying to locate their own homes. This is only one amusing story about the real, symbolic, and perhaps coincidental influence of color on our lives. Color affects us, our moods, our impulses, our mental activity, and even our physical existence. While color defines everything we see, it is also important in feng shui. It is one of the nine basic cures of feng shui and can be used in a positive way to enhance our surroundings as well as improve our lives. By understanding how color affects us, we can enhance our environment, our ch’i, and our lives. The first rule of color choice is to select a color that you really like. To paint an exterior or interior a color because it’s deemed lucky can be annoying. Stand up for what you like. 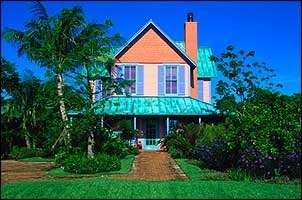 The next rule of color is to understand how the color or colors of an exterior or an interior will affect you. First choose the colors that you like. Then understand how they will affect you. Too much of a good thing can be a bad thing. One young entrepreneur in Washington, D.C. painted his entire apartment red, apparently the same shade as legendary financier J.P. Morgan’s office. The ubiquitous red, however, created too much fire in the normally calm businessman. After engaging in his first-ever barroom brawl, he decided to repaint part of his home in off-white, and add plants to help him keep his cool. The result? He became notably less contentious. Color has such a profound affect on us. It can be stimulating, evocative, depressing, or calming. Our responses to and our connotations of color can also be cultural. The Chinese, for example, consider certain colors more auspicious than others. Red, to the Chinese, embodies happiness and is traditionally worn by a Chinese bride on her wedding day. The father of a newborn son hands out eggs dyed red to friends, colleagues, and relatives, while the funeral for an individual lucky enough to live past the venerable age of 70 is festooned with red to celebrate the deceased’s longevity. On the other hand, white flowers in a garden might alarm certain Chinese, as white is their traditional color of deepest mourning. At a funeral, the family of the deceased will don simple, unbleached muslin robes to express their humble bereavement. To the Chinese, the traditional Western white wedding gown is a negative omen — and, they joke, the reason why Western divorce rates are high. When I got married in my grandmother’s ivory tulle and satin Edwardian wedding dress, Master Lin Yun bestowed upon me a metal Bodhisattva hanging from a red satin ribbon — I suppose to counteract the bleak omen of my white outfit. Purple or plum is auspicious, standing for nobility, power, and wealth. Green stands for hope, development, spring, tranquility, and growth. For more color associations, read Feng Shui Design, page 42, and Living Color, page 45-48. Home Offices: Those of you with home offices may be wondering about color schemes. When looking at your home office, the same considerations for individual business offices apply. Feng Shui Design addresses colors and arrangements for home offices on pages 130-133 and page 180. In the individual rooms in a house, certain colors are more appropriate than others and can be used to enhance the room’s atmosphere and uses. Below you will find some ideas for various rooms in a house. 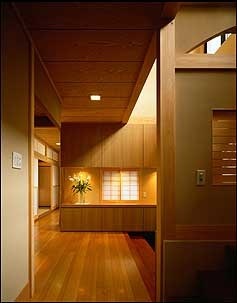 Generally, unless an entrance area is very spacious, a well-lit, light-colored foyer is best. Use hues that encourage hope and are warm and welcoming, such as off-white or pale shades of blue, green, or pink. These colors can enhance our ch’i and create a pleasant first step to relaxing at home. With large entries, dark colors are fine. 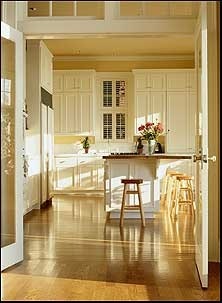 With small, constrained foyers, light colors and good lighting will enhance the space. According to Master Lin Yun, white is the best color for a kitchen. Besides symbolizing cleanliness, white also provides a good background for food preparation as it contrasts well with the vibrant colors of vegetables, fruits, meats, and seafood. While all-black and all-red kitchens are to be avoided, black and red can be used to accent a mostly white kitchen. The most appetizing colors for a dining room are a shade of pink, blue, or green. Black and white are colors less conducive to food enjoyment, but they can also discourage eating and are good to consider if someone in the family has a weight problem. Living Room The best colors for living rooms are pale earth tones such as yellow, tan, and beige, or green or blue. But make sure this space is full of other colors to help stimulate lively conversations and ideas when you are entertaining guests. Colors in bedrooms can enhance marriage prospects for the single person. Pink and peach are good colors for a person seeking a mate. One anxious mother in Berkeley painted each of her four teenage daughters’ bedrooms peach. Pink, a particularly auspicious and flattering color, is best for a master bedroom. Light green or pale blue — colors of hope and development — are also good bedroom colors. The color of blankets should also be considered. Traditionally in China, when a couple gets married, they are presented with a red or pink quilt cover. Chinese avoid white blankets, reminiscent of a death shroud, because sleep might seem death-like. Yet white sheets are fine. Blue or green blankets may foster development in youngsters. Yellow blankets are good for the elderly. Black or white are good colors for bathrooms. Brightly colored towels can enhance a black, white, or black-and-white bathroom. 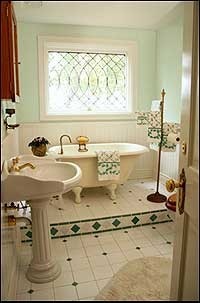 Lighter hues such as grays or pastels are also good colors for bathrooms. More About Color: For more information on the myriad ways color affects our lives, read Interior Design with Feng Shui, page 139, or Feng Shui Design, pages 113-115 and 133-135. Color application can be complicated and highly symbolic, making the use of dynamic color schemes a fascinating puzzle to solve. You can use color to enhance areas of the ba-gua on the inside and the outside of a house. In my own home, when my children were both under one-and-a-half years old, I had a hard time finding qualified and dependable help. As an experiment, I planted white flowers by the “helpful people” area of our house and shortly after, by chance, we found a wonderful babysitter who, eight years later, still helps out with the kids. Each area of the ba-gua octagon is associated with certain colors. So, specific colors can be applied to specific areas of a home to enhance the corresponding area of residents’ lives, as well as their ch’i. If you hope to achieve greater recognition in your endeavors, you might install something red in the fame area of your home or bedroom. If you want to improve finances, you might put a plant or something red or purple in the wealth area. Observe each room in your home, and let the feel of the rooms sink in for a few minutes. Be sure to take notes about which colors and what rooms your reactions take place in. Are you happy with the color schemes in your home? What colors do you react strongly to, either positively or negatively? Do you react positively (or negatively) to the same colors throughout the house, or only in a specific room? Think about adding accent colors to enliven monochromatic rooms. 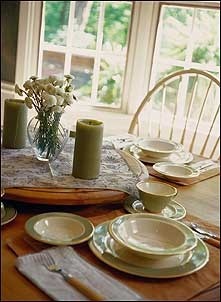 Or figure what color or colors could be eliminated from a busy room that may make it a visually calmer space. This exercise should enable you to bring about some quick solutions to arrangements in your house that are less than optimal. Other changes, of course, require much more time and effort.